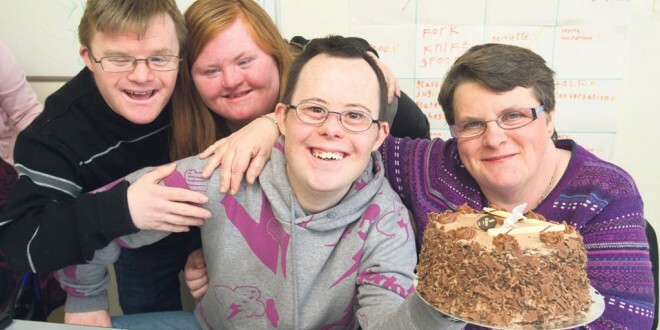 Paul Kirrane of Ennis celebrates his 29th birthday with friends and fellow students, Brendan Barrett, Ennis; Ciara O’Loughlin, Inagh and Martina Ryan, Kilrush, while they attend a Latch-On literacy course, run by the Ennis branch of Down Syndrome Ireland. THEY were one of the forgotten groups of Irish society; let down by the third level education and the health system. Jill Hayes from Corofin hard at work. For years, young adults with Down Syndrome (DS) had nowhere to go, once they completed training schemes with voluntary organisations like the Brothers of Charity. There was no properly structured strategy or adequate funding to help the majority of young people with DS secure meaningful employment. They were left to their own devices, in a frustrating limbo with nothing to do. Two years ago, the Clare branch of Down Syndrome Ireland became one of the first groups in Europe to introduce the first comprehensive literacy programme for young people with Down Syndrome entitled Latch–On Literacy and Technology Hands-On. For the first time, young adults with an intellectual disability were included in an evidence-based, multimedia literacy programme in a post-secondary environment, using computer technology to enhance literacy, self-confidence, independence and employment opportunities. Pioneered by the The University of Queensland, Australia, this two-year literacy programme was made available to Down Syndrome Ireland through a licensing arrangement, managed by the University of Queensland company, UniQuest Pty Ltd. It was subsequently rolled out to 11 other educational centres throughout the country. It focuses on developing the students’ reading, writing, communication, technology and creativity skills. All of the students are members of the Clare Library Service and read a book on a weekly basis. Under the tutelage of former Stonehall National School principal, Betty Murphy, classes are being delivered to 12 young adults using real-life experiences and workshops every Tuesday and Thursday at the Ennis Training Resource Centre, Clonroad. According to Latch-On co-ordinator, Barbara Roche, this innovative programme has been an “outstanding success”. In fact, it has had such a positive impact on the lives of the participants that a post-graduate follow-on course will be provided to the current students from September. Recruitment has started to secure a qualified secondary or primary school teacher with an interest in DS. Ms Roche explained this programme is tranforming the lives of its participants. “It helps people with Down Syndrome integrate into society by improving their social skills. In addition to improving their reading, computer and overally literacy skills, it has improved their self-esteem and confidence, which has helped them to get involved in their local community, which they couldn’t do previously. “It has helped some of the participants to secure part-time jobs in a local newspaper office, solicitor’s office, supermarket and restaurant. Participants were shown how to complete curriculum vitaes and mock interviews for jobs,” she said. The new two-year programme will allow students to continue the development of their literacy skils through Latch-On extension modules, as well as the introduction of a social and political education programme. 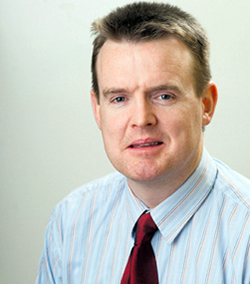 Five European Down Syndrome Associations have been involved in testing this programme. Some practical aspects of the course include developing presentation and public speaking skills, learning about the democratic process through role-play, multi-sensory teaching approaches and visiting places of political relevance. It aims to empower participants to become more engaged with the world they live in and to participate fully in their local and broader communities as equal members of society. This course is not grant aided. It is funded by the students themselves and the Clare branch of Down Syndrome Ireland, which is financed by voluntary donations from the public, including the annual 600km Tour de Munster cycle in August. For further information about the new programme contact Ms Roche on 6841284.